On izzyreads.com the Business Category describes books on a wide range of topics including management, marketing, finance, banking, technology and data management. 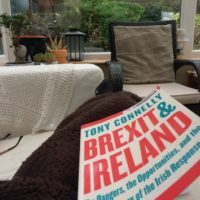 The blurb for Tony Connolly Brexit & Ireland promises the inside story of the Irish response to the outcome of the UK’s 2016 referendum on EU membership. Connolly, Europe editor for Ireland’s public broadcaster RTE, kicks off with a description of events on the night of 23 June 2016. Drinks flow in a Brussels bar where UK officials await the referendum result. EU officials watching the results on Sky TV. Irish officials prepare to convene at Government buildings at 3 am. Farmers go to bed expecting ‘remain’ to prevail. But ‘leave’ won and Connolly’s book describes what has happened since that night. It’s a highly readable and absorbing account covering developments up to autumn 2017. Connolly is strong on the interactions between Irish politicians and civil servants and their European and British counterparts. While many of the key events described are familiar from Brexit news coverage, Connolly’s behind the scenes insights and commentary are fascinating. As well as covering politics and policy, Connolly brings Brexit to life by talking to business owners. There is a mushroom business owner nervously watching sterling on the night of June 23. There are farmers heading for bed thinking that ‘remain’ will prevail and waking to find ‘leave’ has won. Connolly looks in detail at dairy and beef farmers, a fishing business and various entrepreneurs. He outlines their reliance on the UK market and describes the interactions between businesses in Ireland and Northern Ireland. The later sections of the book focus on the evolving debate about the post-Brexit border between Ireland and Northern Ireland — a debate still ongoing at the time of writing. At 350-odd pages, Brexit & Ireland is a fast and absorbing read and an insightful overview of developments thus far. Brexit & Ireland | The Dangers, the Opportunities, and the Inside Story of the Irish Response by Tony Connolly is published by Penguin. The Second Curve, Charles Handy’s latest book, looks at current trends in capitalism and asks whether it is a sustainable system. Back in the days when I was a business librarian, Handy’s books on management — Understanding Organisations, Gods of Management, The Future of Work, and The Empty Raincoat to name just a few — were among the most frequently requested titles on the shelves. In his latest book, The Second Curve, Handy sets out his vision of how society, governments, business and economies will change over the next 20 years. He believes that many things that work today will not continue to work into the future. Consequently, he argues that now is the time to embark on a ‘Second Curve’. Change comes about slowly. The Second Curve — a collection of 16 essays — aims to trigger conversations. The themes it covers relate to society, the workplace, the market, democracy, capitalism, and education. In each essay, Handy assesses where we are now and forecasts what the future may hold. He suggests how — individually and collectively — we can map the way forward. He argues that we need a better measure of economic growth than GDP. He is a fan of the economist Diana Coyle who, in her book GDP: A Brief but Affectionate History, suggests that policymakers should adopt a dashboard of measures. Growth, Handy believes, is a simplistic goal. Instead, he argues society should focus on measurements that take flaws into account as well as success and encourage the idea of “enough”. Longer life expectancy means longer working lives and retirements. Instead of a ‘job for life, in future, people will enjoy more than one career. Sometimes illness or redundancy may trigger an individual’s second curve. Sometimes individuals themselves look at their future prospects in a particular institution and decide that there is nothing to wait around for. These individuals opt to reinvent their careers before it is too late. Handy sees a bright future for people who carve out new careers in an economy powered by what he terms, “fleadom” or self-employment. Where these small ventures are successful, they then create work for other individuals. Just as Handy challenges traditional views of the society and the workplace, so he challenges the market. He is no fan of the bonus culture. He argues that the priority given to shareholder value in the 1970s distorted the priorities of managers. It also created a harmful emphasis on the short term. Capitalism and democracy are uneasy bedfellows, he suggests. “if the former is to survive it must be seen to benefit all not just a favoured few”. Handy believes that we can do better, individually and collectively. He suggests we rethink our various roles recognising that to make change happen, the starting point is ourselves. In the digital age, your reputation is a valuable asset. All kinds of people can access all kind of information about you with — or without — your permission. Reputation management is increasingly important and learning to manage our reputation is a skill we all need to learn. Get it right, and the world is your oyster, says Michael Fertik author of The Reputation Economy : How to optimise our digital footprint in a world where your reputation is your most valuable asset. Get it wrong? Don’t panic. Reputation management can be learned. Fertik shares advice to help you know when to set the record straight and when to simply move on. Balance out the negative by crafting and managing positive messages that enhance your digital reputation across all the platforms you use — professional and personal. Fertik points out that data stored about you has an indefinite lifespan and can show up anywhere, anytime. Not only that, but more and more, we’re all being scored on the data that’s held — scored for our customer value, our credibility, even our health and longevity. The scorer is a computer and our achievements that count are the ones that can be measured — that we increased sales by x%, decreased employee turnover by x%., and so on. Friends matter too. Got the wrong kind? Watch out, that could affect you in ways you weren’t expecting. But the good news is that reputation, like the stock markets, goes through highs and lows so if your’s takes a hit, don’t give up. The Reputation Economy is readable, relevant and full of practical insights and tips. We all have reputations and this a good guide to learning how to mind them. The Reputation Economy by Michael Ferkik and David Thompson is published by Piatkus. Izzy Reads is an Irish book blogger, reviewing mostly literary and contemporary American, British and Irish fiction, political and literary memoirs, biography, history and poetry. Contact @Izzy_Reads.